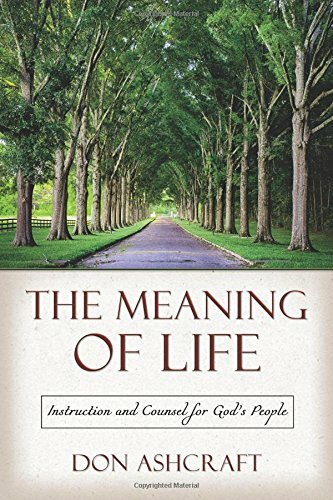 In “The Meaning of Life: Instruction and Counsel for God’s People,” the author provides biblical wisdom for readers of all ages that guide their relationship with God, their family life, and their communication skills. Indeed, this book touches on every aspect that guides every reader to have a more stronger faith and perspective in life. Don Ashcraft reaches out to every reader as he brings a wonderful book that guides each one towards a purposeful and meaningful life. He talks about how to live a life that God has planned for each person, how to find growth in one’s spiritual and personal life. All in all, it’s a one-of-a-kind read that helps a person navigate through his or her everyday life. “The Meaning of Life” touches on the basic matters that create the biggest impact on each person’s life. It includes God’s important message of love and forgiveness as well as building one’s faith and spirituality to become to find strength in everything that they do. This book is created to touch the lives of many readers from different ages and walks of life. There are chapters that are dedicated to helping readers deal with the pain and struggles that come in life, to avoid leading a life with fragmented thinking, and to understand God’s plan for everyone. Not only that, this book comes with review questions and Scripture cards dedicated to one’s personal use. Indeed, this book touches on every aspect that guides every reader to have a stronger faith and perspective in life. “The Meaning of Life” will join the celebration for the upcoming 2019 Los Angeles Times Festival of Books. The festivities will take place on April 13-14, 2019 at the University of Southern California. Don Ashcraft has a Master of Science in Electrical Engineering degree, and for thirty-one years led teams of engineers to design and build large electronic systems for the U.S., British, and Australian navies. The author of “Tongue-Tied No More: a Complete Guide to Conversational Evangelism’ and gospel tracts in two languages, he has taught positive parenting and interpersonal communication skills based on the Bible in home groups, churches, and the adult education division of Fullerton College.